A knowledge of the structure and growth of plants is an aid to understanding some of the problems that develop when growing plants. All seed-producing plants have vegetative organs (roots, stems, and leaves) and reproductive organs (flowers, fruits, and seeds). Ferns have vegetative organs and reproduce by spores. Roots anchor the plants. They also absorb water and plant nutrients from the soil and carry these upward to the stem. Some roots are modified for food storage. Carrots, peonies, and rhubarb are familiar examples. Although most roots grow under the surface of the soil, aerial roots develop on some plants, most often on those that grow in tropical rain forests. The form of the root system can vary greatly. A plant is said to have a taproot when a single root grows straight down and lateral roots develop from this main root. The taproot may or may not serve the additional function of food storage. Taproots modified for food storage as in the carrot and beet are called fleshy taproots. Some plants develop fascicled roots, with many roots of about the same size radiating from the base of the plant. In most plants these fascicled roots are slender and are referred to as fibrous roots. Such members of the grass family as corn have a fibrous, fascicled root system. In other plants, like dahlias and peonies, the fascicled roots are modified for food storage and the main roots are fleshy. Most stems develop above ground and are variously branched. The functions of the stem are to support the leaves in such a manner that they are exposed to the maximum amount of sunlight and to transport water and minerals upward to the leaves and the manufactured foods downward from the leaves to the roots. Food storage is another function of certain stems. Other stems develop underground. The rhizome of quack grass is a creeping, underground stem. The fleshy rhizome of the iris plant develops at the ground surface and may be partly below ground. The edible tuber of the Irish potato is a fleshy stem that develops underground at the end of a slender rhizome. In the gladiolus, the corm is a modified fleshy stem. In the lily and onion, food is stored in bulbs consisting of a conical stem and fleshy leaf bases. The fleshy stems of the cactus are green and carry on photosynthesis, or food manufacture. Leaves are generally flat and green. They may be rather small and scalelike in some plants, as in the arborvitae, or needlelike, as in the pines. The major function of leaves is photosynthesis. Some leaves are modified for food storage, and the scales of the lily bulb are modified leaf bases. 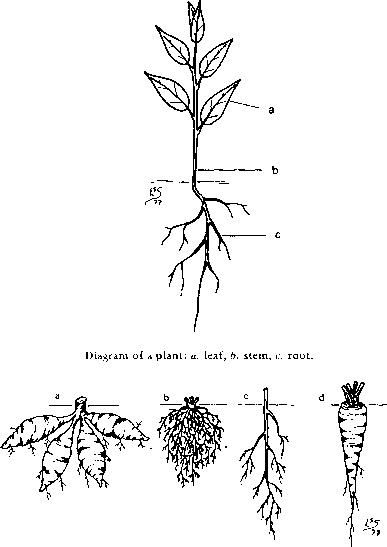 Types of root systems: a. fleshy fascicled, b. fibrous fascicled, c. fibrous taproot, d. fleshy taproot. 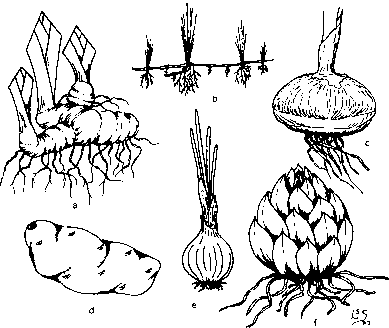 Modified stems: a. rhizome (iris), b. rhizome (quack grass), c. corm (gladiolus), d. tuber (potato), e. bulb (onion),/, bulb (lily). petiole that supports the leaf blade. In some plants there are two bractlike stipules at the base of the petiole. The venation of leaves is either parallel or netted. Parallel venation is characteristic of most monocots; netted venation, of most dicots. A simple, netted-veined leaf has either a single midrib from which lateral veins radiate (pinnate venation) or several veins of about equal size radiating from the base of the blade (palmate venation). The elm and the maple respectively illustrate these two types of venation. A compound leaf may be pinnately compound (as in the green ash), twice pinnately compound (as in the Kentucky coffee tree), or palmately compound (as in the Ohio buckeye and Virginia creeper). 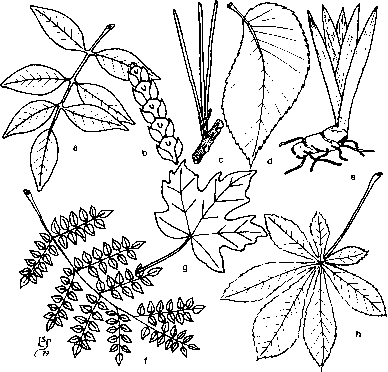 Types of leaves: a. pinnately compound, b. scale, c. needle, d. pin-nately simple, e. simple, parallel veined, /. twice pinnately compound, g. palmately simple, h. palmately compound. ward, the margin is serrate. A scalloped margin with rounded teeth is crenate. Leaves can also have different kinds of lobes. The oak leaf is pinnately lobed, the maple leaf palmately lobed. Lowermost leaves, usually green. Collectively called the calyx. Attached above the sepals. Usually colored to attract pollinating insects. Collectively called the corolla. Pollen-producing organs located above the petals. Each stamen has a stalk portion, the filament, and a pollen-producing part, the anther. Collectively called the androecium. 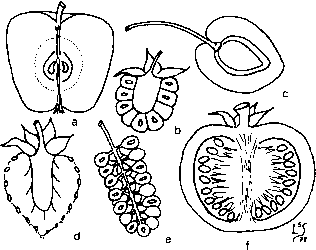 Diagram of a flower: a. petal, b. stamen, c. pistil, d. sepal, e. receptacle. Carpels. Located in the center of the flower. One or more carpels make up the pistil. There may be one or more pistils per flower. 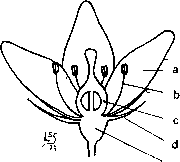 The basal portion of the pistil is the ovary, the neck portion the style, and the upper, flattened or feathery portion the stigma. Complete flower. Has all four kinds of modified leaves. Incomplete flower. Lacks one or more kinds of modified leaves. Perfect flower. Has both stamens and pistils and may or may not have sepals and petals. Imperfect flower. Has either stamens or pistils, not both. May or may not have sepals and petals. Spike. An inflorescence in which the flowers are unstalked and borne along a long axis. Examples: timothy and plantain. Raceme. The flowers are borne on short stalks, or pedicels, along an elongated axis. Example: chokecherry. e. corymb,/ umbel,,?, compound umbel, h. head. An open type of inflorescence with branching and rebranching. Oldest flowers are near the base. Examples: brome grass and PeeGee hydrangea. Similar to the panicle except the oldest flowers are at the tip of the stem and lateral branches. Example: baby's breath. Similar to the raceme but the lower pedicels are elongated, resulting in a flat-topped flower cluster. Example: cluster roses. Has several elongated pedicels that arise from a common point. Example: onion. Compound umbel. Produces a simple umbel at the end of each pedicel. Example: carrot. Head. Has unstalked flowers clustered at the end of the stem. In certain members of the sunflower, or composite, family, the marginal (ray) flowers have strap-shaped corollas. The center flowers are called disk flowers when they differ from the ray flowers. Examples: clover and sunflower. Fruits are formed from the fertilized ovary and sometimes include other parts of the flower such as the receptacle. Fruits are of many types and often prove useful in plant identification. Fruits are either dry or fleshy at maturity. Grain, or caryopsis. Has a single seed that is fused with the ovary wall. Examples: wheat and corn. A single-seeded, dry fruit in which the ovary wall is distinct from the seed coat. Example: clematis. Similar to the achene but has a winged portion which aids in seed dispersal. Produced in pairs (as in the maple) or separately (as in the ash). A specialized type of fruit produced by members of the carrot family. Its ovary separates at maturity into single-seeded segments. Example: parsnip. A podlike fruit with a single row of seeds. When the pod opens, it separates along two sutures. Examples: garden pea and snap (string) bean. 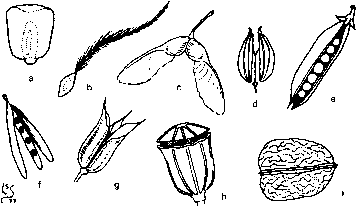 Types of dry fruit: a. caryopsis (corn), b. achene (clematis), c. samara (maple), d. schizocarp (carrot), e. legume (pea), /. silique (mustard), g. follicle (delphinium), h. capsule (poppy), i. nut (walnut). May be either elongated and round or flattened and disk-like in cross section. Has a central partition dividing the fruit into two equal parts. Usually opens to shed the seeds. Example: mustard. Each carpel opens along a single suture to discharge the seeds. Examples: delphinium, milkweed. A multicarpelled fruit that usually opens near the tip to discharge the seeds. Examples: lily and poppy. Has a hard shell surrounding the seed or seeds. Some nuts have a pulpy covering on the shell. Example: walnut. Has several seeds borne in compartments at the center, or core, of the fruit. The fleshy part is really the receptacle of the flower that has grown up around the ovary. Examples: apple, Juneberry, and hawthorn. A collection of fleshy carpels resembling small drupelets. The fruits separate from the receptacle (as in the raspberry) or the receptacle breaks off with the fruit (as in the blackberry). Has a hard shell enclosing the seed or seeds. The shell is surrounded by fleshy pulp, which in turn is surrounded by a thin skin. Examples: cherry and peach. Accessory. Edible portion is the enlarged receptacle in which are embedded the achenes, or "seeds." Example: strawberry. Multiple. Formed from several flowers borne along a short axis. Examples: mulberry and pineapple. Berry. A many-seeded fruit in which the seeds are embedded in pulp. Examples: tomato and grape. The plant cell is the unit of structure in plants. Some primitive plants may consist of a single cell or a chain of cells. In higher plants there may be millions of cells in various shapes and sizes. The typical cell consists of a cell wall and a living protoplast that practically fills the cell. The outer membrane of the protoplast is called the plasma membrane. The vacuole is a cavity in the center of the cell and is filled with water, various nutrients, and sugars. The living protoplast is composed of the nucleus (with nucleolus) and cytoplasm. Chloroplasts, starch grains, and other cell components are embedded in the cytoplasm. Parts of a plant cell: a. cell wall, b. plastid (chloroplast), c. plasma membrane, d. plastid (starch grain), e. vacuolar membrane,/, nucleus,g. nucleolus, h. cytoplasm. Cells near the root and stem tips, the apical meristems, are compact, dense with protoplasm, and capable of repeated cell division. These cells are responsible for the terminal growth of both roots and stems. The cambium is a cylinder of cells, one layer thick, that lies between the bark and the wood. The cells of the cambium divide, adding thickness to the stems and roots. Cells formed by the apical meristem and cambium differentiate into a variety of cell types that perform different functions. The outermost layer of cells on young root tips, young stems, and leaves are the epidermal cells. These have a layer of cutin, a waxy substance deposited on the outside to protect the plant from water loss. Directly under the epidermis the cells are thin walled and usually hexagonal in cross section. Such cells are living and often are filled with starch grains. These and the cells in the center of the stem, the pith, are called parenchyma cells, and function in food storage. Types of cells: a. stomate with guard cells, b. epidermis, c. parenchyma, d. stone, e. fiber, /. sieve tube, g. companion cell, h, tracheid, i. vessel. row. As the vessels mature, the end walls dissolve and the walls thicken, usually with spiral thickenings. The mature vessels form continuous tubes connecting the root tips with the leaves. The function of these vessels is to transport water and plant nutrients from the root tips to the leaves. In conifers and ferns the water-conducting cells are called tracheids. These are elongated cells with thickened walls and connected by lateral pores. The water and plant nutrients move upward in a zigzag manner. Other cells that are differentiated include the fibers and stone cells. The fibers are elongated, taper pointed, and have thick, lig-nified cell walls that provide strength and support. Stone cells are irregular in form, with thickened cell walls. They have no special function. Plant tissues are composed of various kinds of cells. Simple tis sues, with one type of cell, include the epidermis, cortex, pith, cork, and meristems. Complex tissues contain several different types of cells. The phloem and xylem are examples. Cells deposited by the cambium toward the outside of the stem or root constitute the phloem, which is made up of sieve tubes, companion cells, parenchyma, and fibers. Cells deposited by the cambium toward the center of the stem or root constitute the xylem, which contains vessels or tracheids, parenchyma, and fibers. The manner by which water and plant nutrients enter and move through the plant is of great interest to the gardener. First, let us understand the role of water in the plant. Water is a constitutent of all living cells and may constitute 95 percent or more of cell weight. Water filling the cells and pushing against the cells walls keeps the plant tissues turgid. 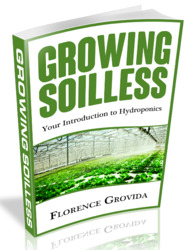 Water is a raw material in the process of photosynthesis (see p. 26) and serves as a solvent for plant nutrients that enter from the soil and for foods manufactured by the plant. The evaporation of water from the plant has a cooling effect on the plant and its immediate surroundings. Water enters the plant primarily through the roots and to a lesser extent through the leaves. The root hairs, which are extensions of epidermal cells and located directly behind the root tips, have direct contact with soil particles. These hairs greatly increase the water-absorbing surface of the plant. A film of moisture surrounds each soil particle. The outer portion of this film is capillary water, which is free to move in the soil and enter the root hairs. The root hair is a living cell within which the protoplast presses tightly against the cell wall. In the center is the vacuole filled with cell sap containing sugars and minerals in solution. Water and nutrients enter the cell by the process of osmosis through the plasma and vacuolar membranes. If the water concentration in the capillary water surrounding the soil particles is higher than the water concentration in the cell sap, water enters the root hair. This in turn causes water to move into adjoining cells of the cortex. Each mineral element in the soil enters by the same process, depending on relative concentrations of the element and always moving from high to low concentrations. spiration pull that draws on water entering from the root hairs. Water continues to enter the plant and move upward so long as the transpiration pull exceeds the adhesive forces holding water in the soil. During periods of drought and high evaporation, water intake may not keep up with water loss and temporary wilting can occur. If such conditions of stress persist, permanent wilting and death of the plant results. Photosynthesis has been called the most important chemical reaction in nature. Without this process, no life on this planet would exist. The process is essentially a chemical one in which carbon dioxide combines with water to form a simple sugar. Photosynthesis requires light as an energy source and the presence of chlorophyll. It occurs only in living, chlorophyll-bearing cells that are exposed to light. The process can best be compared to a manufacturing process. The leaves are the factory, the palisade and mesophyll cells the rooms, and the chloroplasts the machines. Carbon dioxide, which comprises .03 percent of the air we breathe, and water are the raw materials. Sunlight or artificial light supplies the energy to run the machines. Simple sugars constitute the main manufactured product and oxygen is a by-product. The sieve tubes and the vessels are the transportation system, and special storage organs serve as warehouses. From the simple sugars complex carbohydrates, fats, and proteins are synthesized. Respiration is a process that takes place in all living cells, both plant and animal. Chemically, the process is the reverse of photosynthesis. Simple sugars are oxidized to form carbon dioxide and water, and energy is released in the process. Respiration occurs all the time. The rate of respiration is directly proportional to the temperature. Growth in plants can be divided into four steps: cell division, cell enlargement, cell differentiation, and cell maturation. 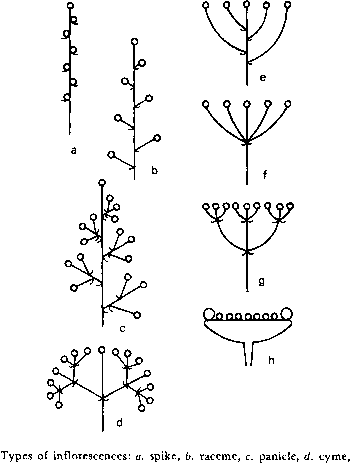 Cell division occurs in the apical meristems of stems and roots and in the cambium. Cell enlargement includes the stretching of the cell wall and the dispersal of the protoplasm. Differentiation may involve the thickening of the cell walls and the disappearance of the protoplast in cells like vessels and fibers. In cell maturation the cells become part of the mature tissues. 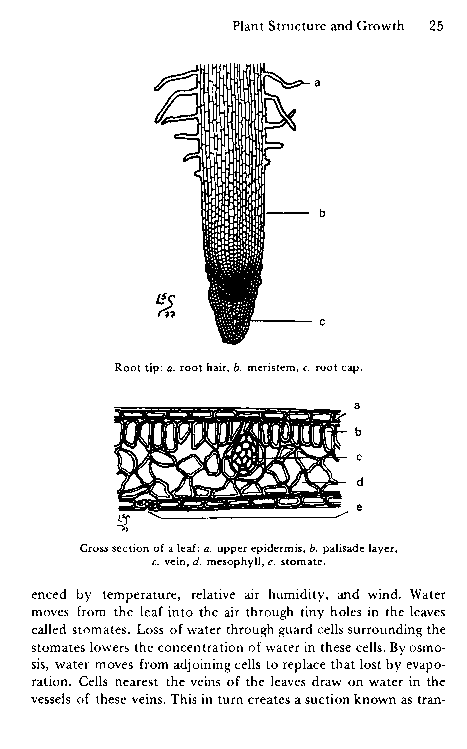 Growth in length occurs at the stem and root tips; growth in diameter, on either side of the cambium. In certain leaves the base of the leaves remains meristematic, and elongation occurs at the base of the leaf blade. This is true of grasses. Plant growth may be either vegetative or reproductive. In annuals, vegetative growth takes place early in the growth cycle, followed by flowering and fruiting and finally death. In trees and shrubs, vegetative growth may continue for several years before reproductive growth begins. In perennials, vegetative growth generally precedes reproductive growth each season, except in certain wild flowers that flower early in the spring. Maintaining a proper balance between vegetative and reproductive growth requirements is essential to successful gardening. Shade and high nitrogen levels in the soil favor vegetative growth, full sun and high phosphorus levels reproductive growth. How to identify iris bulb roots? What is the function of a fascicled top root? Is gladiolus a simple leaf or a compound? What is a node on a plant? What are the types of modified leaves? How to draw a fibrous leaves? Which are tap root on hawthorn? What is a peace lily leaf node? How to draw tap root of rose?